Kerastase Masque Oleo -Relax Slim is an intense smoothing masque for thick, dry, rebellious hair designed to reduce volume and leave hair silky soft and super sleek. Formulated with Cera-Trioleum, a unique trio of oils including apricot, camelina and pracaxi which slim down the hair fibre for strength and control, it forms a hydraphobic barrier preventing the fibre from swelling and regaining excessive volume. 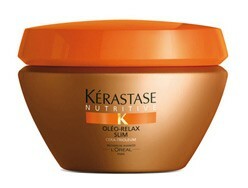 Kerastase Masque Oleo-Relax Slim will leave hair nourished and smoothed with 24 hour anti-volume and anti-frizz protection.